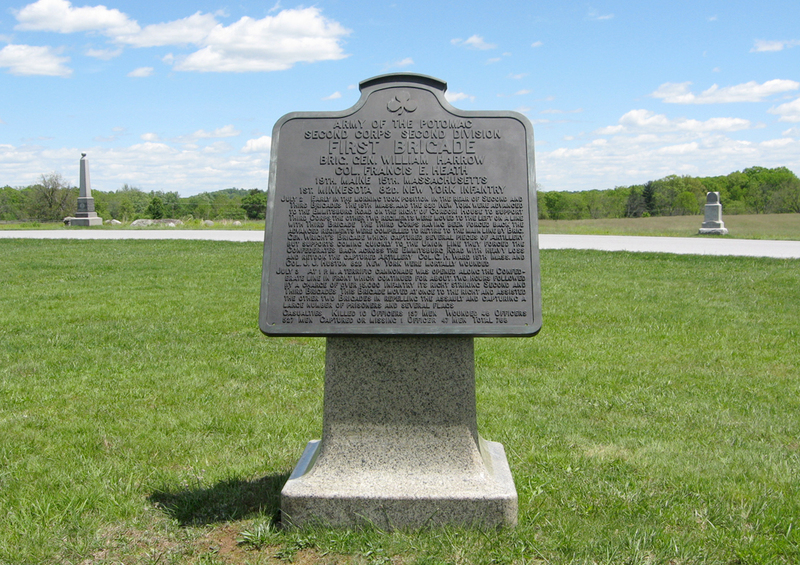 The brigade was commanded at the Battle of Gettysburg by Brigadier General William Harrow, an attorney from Indiana who had been born in Kentucky. Harrow had been a friend and associate of Abraham Lincoln on the judicial circuit in Illinois, which helped and eventually resurrected his military career. For part of the battle Harrow commanded the division while John Gibbon temporarily took over the corps, and again after Gibbon was wounded on July 3rd. Colonel Francis Heath of the 19th Maine took over the brigade during these times. July 2. Early in the morning took position in the rear of Second and Third Brigades. The 15th Mass. and 82d New York were advanced to the Emmitsburg Road on the right of Cordori House to support Third Corps the other two regiments were moved to the left on a line with the Third Brigade. The Third Corps having been forced back the advanced regiments were compelled to retire to the main line by Brig. Gen. Wright’s Brigade which captured several pieces of artillery but supports coming quickly to the Union line they forced the Confederates back across the Emmitsburg Road with heavy loss and retook the captured artillery Col. G. H. Ward 15th Mass. and Col. J. J. Huston 82d New York were mortally wounded. July 3. At 1 P. M. a terrific cannonade was opened along the Confederate line in front which continued for about two hours followed by a charge of over 15,000 infantry its right striking Second and Third Brigades. This Brigade moved at once to the right and assisted the other two Brigades in repelling the assault and capturing a large number of prisoners and several flags.